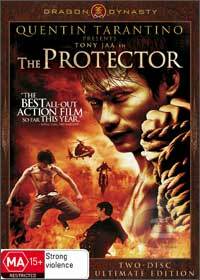 The Protector features martial arts superstar Tony Jaa (Ong-Bak) and is probably one the most intensive martial arts movie of the year that features some of the largest martial art battles to have ever graced the movies. This movie boasts no CGI, stunt doubles nor wires and when our hero is pitted against 50 opponents, one can only help but appreciate the amazing choreography of this title. Although the title is short on plot and horribly clichéd, the story revolves around Kham (Tony Jaa) who goes on a mission of revenge when his father is killed and the elephants that they protected are gone. Seeking out a man called Johnny, Kham travels to Sydney Australia only to encounter an international crime syndicate with its "Empress" and our hero must set things right. Jaa transcends this kitsch, though but fortunately he's an expert Muay Thai fighter and trained stuntman who, like Bruce Lee, never appears to inflict the same injury twice. When he sails into a room, as if by slingshot, your blood pressure rises. The filmmakers are smart enough to slow down the shots so that when Jaa's foot lands on a head, the impact is impressive. Watching him demolish a warehouse full of skateboarding, rollerblading X-Gamers seems redundant, though. He's the only real extreme here. Recommended for lovers of martial art flicks such as Jackie Chan who makes a strange cameo in this movie as if to nod to Tony Jaa but then again this is only a look alike! Definitely pure cheese and full of special feature goodness!